If there is setback, a person with determination analyze what went wrong and use that as motivation to turn it into something positive. Determination is pursuing a goal with energy and focus. It keeps us firmly centered on a chosen purpose. It is the tool we use to keep defeat away to clinch the issue in favor. Being determined makes one firm in taking a challenge in stride with firmness. Believe you can do it, go out there and do it. That's the only way you'll ever do it. Sleep with worries but wake up with determination. You can determine to succeed if the motivation that fosters such determination is strong enough. Nothing in this earth can stop you. I never gave up because I am motivated by the future that I am currently building. If you want to reach 100% of your goals, you have to put 200% of your effort into them. Determination means persistence, striving hard to achieve any goal or ambition. Determination is known to make even the inaccessible peaks, easily accessible. Great achievers are those who possess great levels of determination and never give up, even in the face of adversities. Tenacity is the hallmark of a champion. Determined individuals can only realise their aims in life. In the words of Colin Powell, "A dream does not become reality through magic; it takes sweat, determination and hard work." There is no shortcut to success. Constant efforts and perseverance, clubbed with rock-solid determination, can only catapult any person to success or fame, even. Determined individuals always make it big in life and realise their dreams and goals. Determination for any achievement is generated within the individual, either by efforts or it comes by itself. The difference between dreams and accomplishments is one's desire and determination. 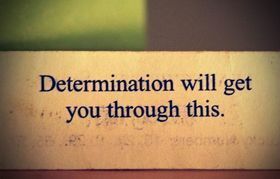 So, show determination towards achieving your life's goal.